A downloadable pdf of our brochure is available from the website immediately after each Festival is launched. All members automatically receive a brochure either at the launch party or by post immediately after the launch. If you would particularly like to have a printed version of the brochure and live locally to Rye, you will find brochures available for collection at the Box Office and a number of outlets around the town such as shops, pubs and restaurants. If you are unlikely to visit Rye before the Festival, please send an e-mail to the Box Office with your name and full address. Discounts on tickets are available to Benefactors and Friends but only when booking in advance. Discounts are not offered for tickets sold ‘at the door’. The discount rate is 15% off every ticket purchased if you are a Benefactor or 10% if you are a Friend of the Festival. To become a Patron or Friend and immediately benefit from the two-week priority booking period and the discounted ticket prices, please click here. Unless it is specifically mentioned, there are no discounts (other than via Benefactor/Friend membership) for any events. In a few instances there are concessions for Senior Citizens and children, these are marked quite clearly against the relevant event. Occasionally we have linked events where a discount may be offered. If this is the case, it will be clearly marked as such. If you need to know specific details about an event finishing time and it does not appear on our website, please contact the relevant Event Coordinator via e-mail. Click here for the Contacts page. Alternatively, please phone the Box Office and they will endeavour to find out for you. All start and finish times are approximate. There are usually a number of events during the Rye Arts Festival that feature Jazz. However, there is a separate Rye Jazz Festival that takes place in August each year. Rye Jazz Festival, which takes place over the August Bank Holiday period each year is not related to the Rye Arts Festival and we cannot supply tickets for it. If you want to buy tickets and are eligible for a Benefactor or Friend discount, please log in when you have filled your basket. Please note that all passwords required a reset in April 2019. 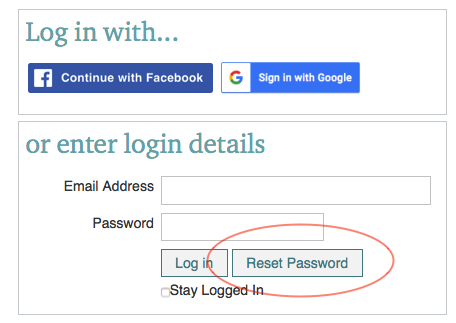 If your old password no longer works, please click the ‘reset password’ button and instructions on how to complete the reset will be sent to the e-mail address we have registered for you. You can ask for your password to be reset at any stage. We suggest you create something that you will find easy to remember but please bear in mind that ‘easy’ passwords are more likely to be compromised. Rye is a very compact town and there is very little on-street parking. There are however, a number of car parks in the vicinity of each of the venues, for most of which a parking fee is applicable. 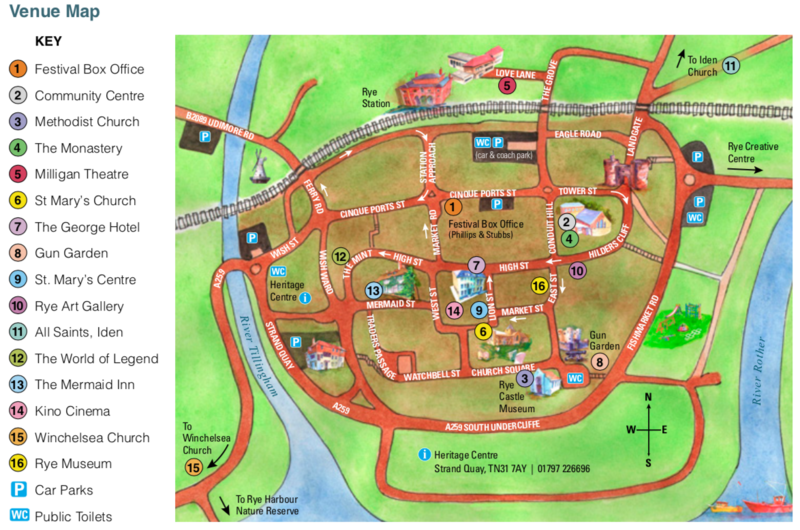 The venue map, which can be found at the front of the brochure (or click here) shows all local car parks. If you are not familiar with Rye and have difficulty walking, or are bringing someone who is, please contact the Box Office for more help and advice. It is usually possible to drop someone off at a venue door and then proceed to park elsewhere. If you wish to buy tickets or membership online you can use a a credit or a debit card, Paypal, Facebook or Google account. If buying tickets for our September festival, you can do so online or by posting a completed order form (found in the centre pages of our Festival brochure) and send with a cheque or your card details to: Rye Arts Festival Box Office, c/o Phillips & Stubbs, 47/49 Cinque Ports Street, Rye East Sussex TN31 7AN. We do not recommend sending cash in the post. During Box Office opening hours you are welcome to visit us at Phillips & Stubbs and pay with a card, cheque or cash. You do not need a Paypal, Facebook or Google account in order to log in or to purchase tickets. When you reach the payment stage, click on the blue “Debit/Credit Card’ wording immediately beneath the orange “PayPal” button (see picture below) to pay with a card. There are no extra fees for making a card purchase. If you add an item to your shopping basket that you later decide you don’t want to purchase, please click on the delete button to the right of the relevant item or the ‘Clear Basket’ if you wish to remove everything. You will also see a ‘Continue Shopping’ button above your basket contents if you decide to add a few more tickets! Tickets purchased online will be sent to you by e-mail. You may print these off at home or just show your confirmation e-mail on a smart phone or tablet to a Steward at the door. You do not have to print off your tickets. We also have lists of all tickets purchased for an event at the venue, so we can easily check your credentials in case of a mishap. If your tickets fail to arrive after your purchase has been acknowledged – Please check your “JUNK” or”SPAM” folder. If they are there, please add our e-mail address to your Contacts list to ensure future safe delivery of tickets. Tickets can be collected from the Box Office during opening hours. Alternatively, it may be possible to collect your tickets from the venue door by asking the Box Office in advance. You will need to bring proof of your purchase with you to gain entry to an event. Tickets can be shown on mobile phones/tablets for scanning at the venue door. There are no allocated seats at any of the events, with the exception of previously-booked wheelchairs. It therefore pays to be prompt when coming to an event.